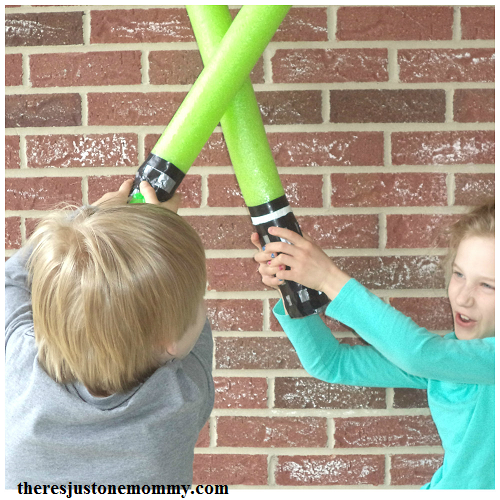 Whether you are looking for a May the 4th Be with You craft, or a Star Wars party activity, lightsabers are always fun. 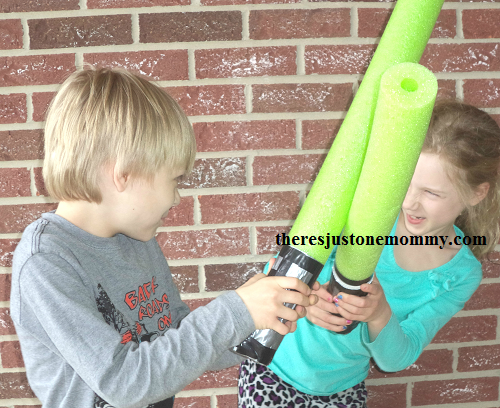 And I promise this pool noodle lightsaber craft will be a huge hit (pun intended) at your Star Wars party. For us it all started with a picture book that told the stories of the original three Star Wars movies. What started as curiosity and flipping through those pages has turned into a Star Wars obsession for both my kids. I even had to come up with a DIY Darth Vader cake for my son who favors the Dark Side. You can easily find pool noodles at the dollar store. And most people have duct tape and electrical tape at home, making this Star Wars kids craft not only easy, but super inexpensive as well. First, use a serrated knife to cut your pool noodle in half. (This step should be done by an adult.) You can also choose to use an entire pool noodle for a super long, extra wiggly lightsaber that is fun to use outside. Next, cover the bottom hole of the noodle with duct tape. One piece will not cover it completely. Overlapping two pieces that are approximately 5 inches long does a nice job. Once the bottom is covered it is time to create your lightsaber’s hilt. Tear off 10 inch long sections of duct tape for your child to wrap around the bottom portion of the lightsaber. The first piece should overlap the duct tape pieces covering the hole at the bottom. 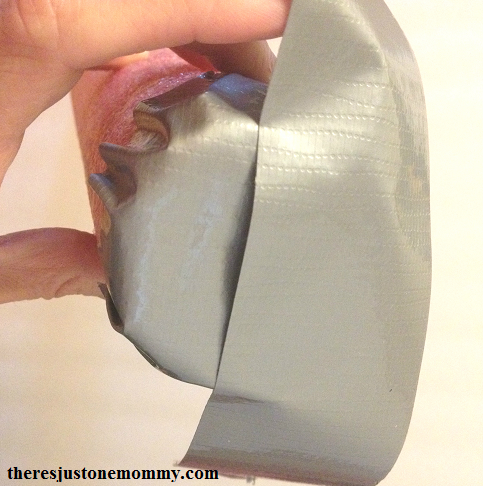 You will need 3-4 pieces of duct tape to make your hilt, depending on how big you want it to be and how much your child overlaps each piece. Finally, it’s time to personalize the hilt with electrical tape. For a younger child you may want to just cut various lengths of tape for them to use. Older children can wrap the electrical tape around the hilt and cut it to the length they want on their own. If you have other colors of duct tape, they can use it for details like buttons. Unlike those plastic lightsabers they sell at the stores, pool noodle lightsabers don’t hurt if you get caught in a battle. They can even be used inside. And, if one breaks, you can easily make a new one. I love it when a good book inspires an interest in something new. I have a feeling this Star Wars obsession will be around for a while at our house. 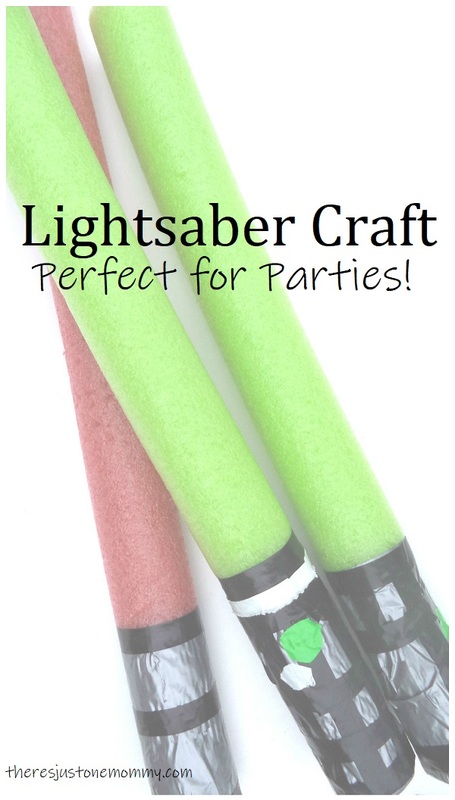 Want your pool noodle lightsaber craft to really glow? 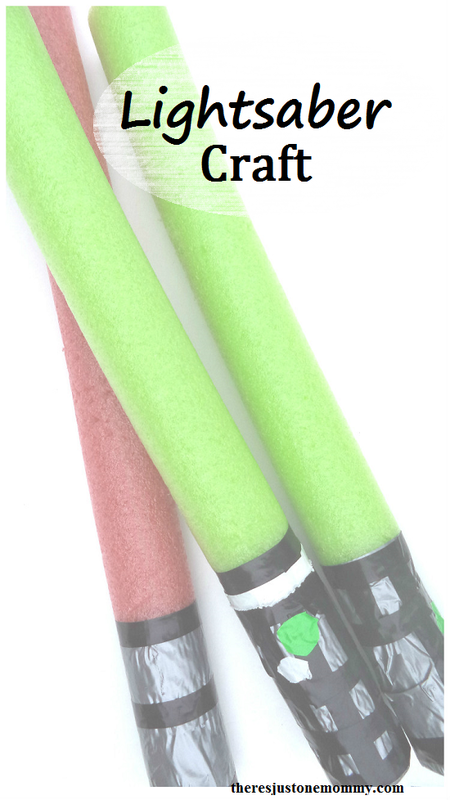 Check out this lightsaber craft at Kids Activities Blog. Simple and so much fun! Thanks for sharing on craft schooling Sunday. When i see pool noodles i immediately think about how i’d like to slice them up to make giant fruit loops for a bowl of cereal costume that we were drooling over just a few weeks back when planning the Purim costumes! I love the idea of turning them into giant fruit loops! So fun! Thanks for linking up with Mama Shares Monday!